In the Islamorada Art District, be sure to enjoy the bayside dock, swimming pool and lush tropical setting. From the vantage of this brand new 3 bedroom Islamorada vacation villa in the Art District, you'll enjoy the marinas, fine dining and entertainment while enjoying breathtaking sunset views. 3 bedrooms, 3.5 baths, a gourmet kitchen and world class amenities including, Free Wi-Fi, Community Swimming Pool, Tiki Hut w/ BBQ, HD Flat-Screen Smart TV`s in Living Room and in all Bedrooms, Washer and Dryer, Dishwasher, Playground and Community Beach, Dock, Floating dock for launching kayaks & paddleboards, Personal Audio Sound System, State of the Art Technology, Gourmet Kitchen and Keyless Entry and Exit. 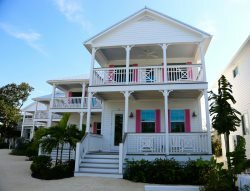 Little Basin Villas are just north of the infamous Green Turtle Restaurant, across from 5 Star resort Cheeca Lodge and in the Islamorada Art District. In Islamorada there are a wide range of outdoor activities like sailing, snorkeling and diving the Coral Reef, sunset cruises, kayaking, paddleboarding, deep sea fishing, bicycle trails, nature preserves, music festivals, The Islamorada Art Walk, the Village Square with shopping and events, historical sites and museums, renowned gourmet restaurants, Full Moon Parties and nightly Sunset Celebrations. The beautiful islands known as Islamorada (the purple isle), stretches for 20 miles throughout the archipelago of the Florida Keys. Ted Williams and Gene Hackman made this place their home, and now Jimmy Johnson, Wyland, and many other celebrities make this place their home today. Little Basin Villas is located at Mile Marker 81 in the renaissance area known as the “Arts District” of Islamorada. It is within walking distance to such famous restaurants as the Islamorada Fish Company, Morada Bay, Kaiyo, Pierre’s & Chef Michael’s. Cheeca Lodge is less than a half mile away, and offers golf, as well as a wonderful spa. Other area attractions are the Hungry Tarpon, Windley Key Fossil Park, Theater of the Sea Marine Animal Park, John Pennekamp Coral Reef State Park, and the many attractions afforded by waterfront living. The property has dockage for up to five 16’-20’ boats. In addition, the property has a floating dock for launching of kayaks and paddle boards. Two larger marinas lie within walking distance to the East and West of the property.